It is possible to make the classpath container be composed of a retrieved dependencies. Instead of having the container point to the jars in Ivy's cache, jars can be retrieved in the project with a specified pattern and have the container be composed of them. To enable this behavior, enter the classpath container configuration panel, select the third tab "Classpath" and select "retrieved artifacts". The Retrieve pattern specifies the location where the dependencies should be copied relative to the containing project. The Delete old retrieved artifacts check box will cause IvyDE to clean the output directory before each retrieve. 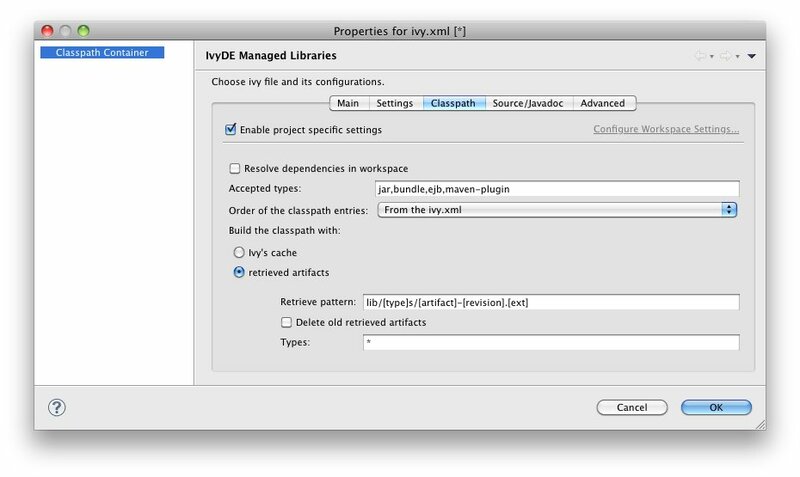 Note that any other artifacts other than those previously retrieved by IvyDE in this container will be deleted as well if this option is selected. Finally, you can select which Types of artifacts should actually be retrieved (* means all). Copyright © 2012 The Apache Software Foundation, Licensed under the Apache License, Version 2.0.